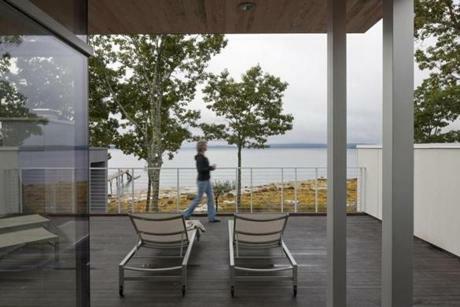 Rose and Ron Dennis had specific goals for their Trenton, Maine, home when they approached William M. Hanley at A4 Architects in Bar Harbor: uninterrupted ocean views, low maintenance, privacy, and energy efficiency. 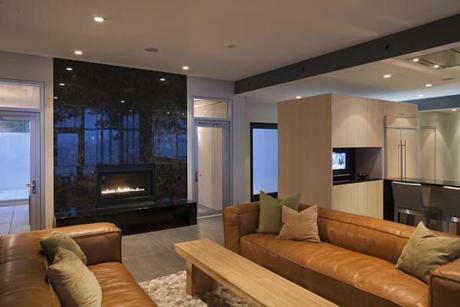 They had a clear aesthetic in mind — a sleek and modern look with an open floor plan. 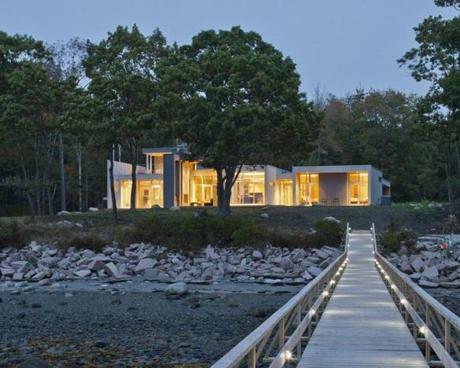 The resulting home is extraordinary in its openness to the sea, with floor-to-ceiling windows — essentially glazed walls — along the water-facing side. 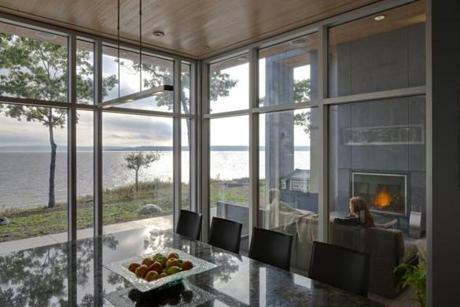 Plenty of outdoor space and windows with uninterrupted views were paramount. 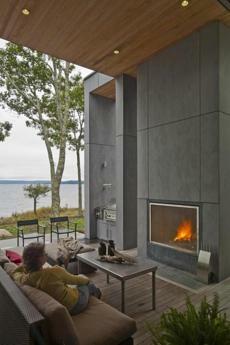 On a high-canopied deck, Rose Dennis relaxes by the wood-burning fireplace. 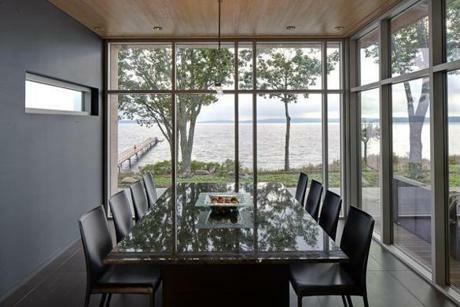 The dining room’s glass walls look out to the sea. The couple wanted to retain the sense of the family camp. 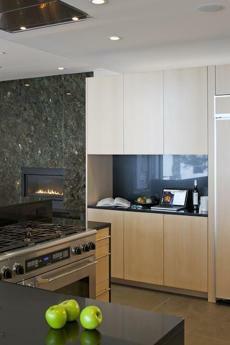 To that end, the kitchen, dining area, and living space are contiguous and open. 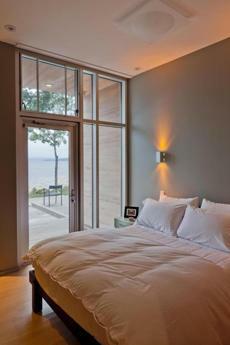 The master bedroom opens to an ocean-side deck. 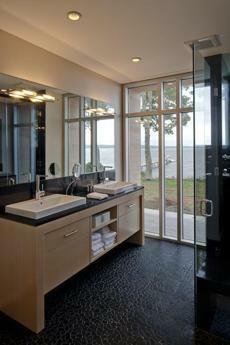 The windows are low-lead, which means tint-free, with exceptional clarity. 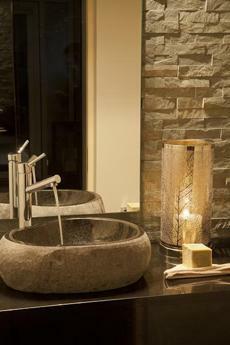 Chic furnishings and high-end amenities are a reminder that although close to nature, you are not roughing it. 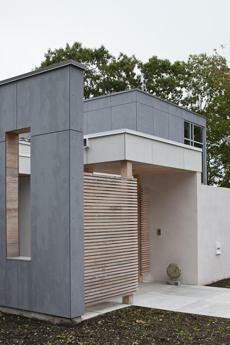 One fortunate and initially unforeseen feature is how surrounding trees’ shadows play on the house. 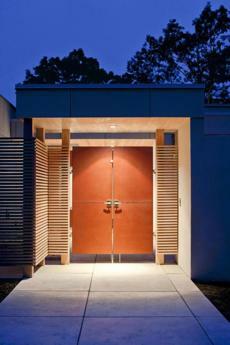 “We started noticing that during construction. The sun is so low in winter, and there are a lot of mature trees on the property. 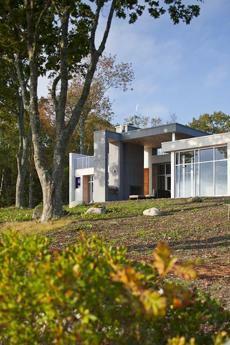 Elongated shadows began raking across the elevations,” says Hanley.